ScreenRepair By Joe Power, Inc. Your One-Stop Resource for Everything Out Your Back Door. Serving the Beaches and Greater Jacksonville Area for all Your Outdoor Living Needs! 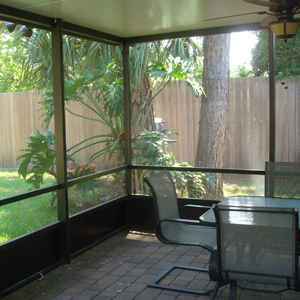 Call A Screen Repair by Joe Power, Inc. for all your screen, pool and patio enclosure needs. As a residential building contractor, we are able to build outdoor living spaces, as well as repair and remodel existing screen enclosures and patio rooms. We also install customized access panels and pet doors. We have been proudly serving the North Florida area since 2000, from St. Augustine to Amelia Island and from Orange Park to the Beaches. We offer free estimates as well as customized quarterly maintenance plans.